Do you like to eat fried foods like chicken or onion rings, but find the process is messy? 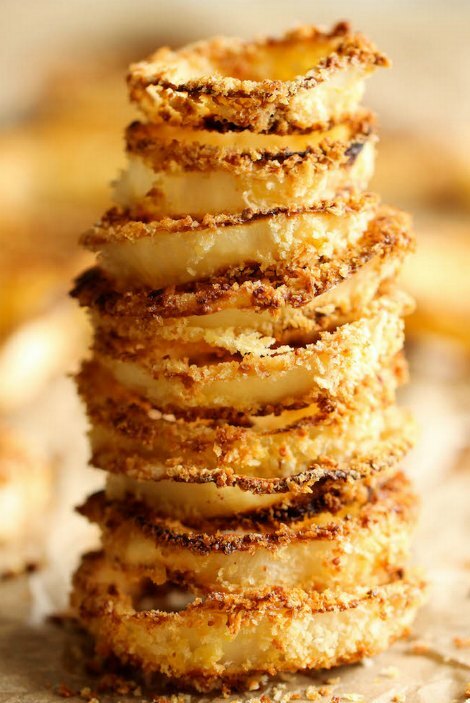 If so, then you might be surprised to know baked onion rings are a simple and tasty treat to prepare. Baked foods offer a healthier alternative to anything that is fried. Baked onion rings do not take long to prepare. You can pre-heat your oven while you add breading to a batch of freshly cut onion rings. Be prepared to bake much more as the first batch will disappear fast. A total of four servings can be prepared from just two onions. You can use any type of breading for your baked onion rings. Seasoning may also be necessary to have a taste that is just amazing. This food will be perfect to use with ranch dressing or homemade dipping sauce. However, they are really yummy one they have cooled after coming out of the oven.